Like Lilliputians lashing down Gulliver, small food companies are chipping away at the market share of Big Food. The question is, will the end game change? Resist the temptation to dismiss the thousands of new and emerging food companies as specialty niche pip-squeaks catering to the food fad du jour. Can they realistically take share from major corporations with 11-figure annual sales? They not only can, they are. Among the largest publicly traded companies on Food Processing’s Top 100 list, one third reported sales declines in 2014, and most of the others registered modest improvements. Aggregate sales declines totaled more than $1.7 billion, a 2.2 percent drop from the prior year. The losers include some of the most venerable names in consumer packaged goods. Investors are frothing to get in bed with startups. Institutional investors that typically favor middle-market firms are scrambling to keep up with venture capitalists and angel investors with bigger appetites for risk who are buying into food startups. Many of them believe food production is undergoing fundamental change, and they want in. They are grafting a Silicon Valley funding model onto the food industry, betting that a fail fast/succeed fast approach can put a handful of winners with enormous upside potential in their portfolios. Tech billionaires are well represented. One example is Ali Partovi, who provided $1.7 million in 2015 seed funding last year to Clara Foods, a plant-based protein developer, after a $23 million investment in Hampton Creek, the creator of Just Mayo, the pea-protein salad dressing that promises to revolutionize the American diet by providing cheap, healthful and flavorful food. We're working on a project and would like to talk to small companies that are hoping to grow exponentially in the food and beverage space, but may need a little help, financial or otherwise. If your company is small, but looking to get bigger, then let us know. Capital availability isn’t limited to firms committed to healthier eating. “We are bombarded every week by bankers, venture capitalists and other lenders,” says Doug Renfro, third-generation president of Renfro Foods Inc. in Forth Worth, Texas. Likewise, in Canada, bankers who might not have taken Kevin Stemmler’s calls a decade ago were more than happy to compete over terms when he approached them last year to underwrite a major expansion for Stemmler’s Meat & Cheese, Heidelberg, Ontario. “Food companies are very stable, and our profit margin has been very good,” says Stemmler, a second-generation company president. Revenues are up sharply and, he reasons, a recession-proof business like food processing is attractive to financiers. Product innovation has helped both Stemmler and Renfro grow. High protein meat sticks with low sugar, salt and fat content are helping Stemmler participate in a school lunch program for Ontario’s 1 million school children. Renfro’s salsas were pioneers in the use of ghost peppers, one of many salsa innovations the 76-year-old firm has introduced. Instead of tales from the old days, companies that trace their roots to the 21st Century need to spin a different tale. For Jon Sebastiani, the story revolved around “artisanal” jerky and the celebrities who eat it. A fourth-generation scion to a Sonoma winemaking family, Sebastiani launched Krave Pure Foods in 2009, attracting a coterie of celebrity investors like trainer and “Biggest Loser” coach Jillian Michaels. Last year Hershey purchased Krave for $218.7 million. The serial entrepreneur now has launched Sonoma Brands, an incubator for emerging small firms backed by Velocity Made Good (VMG) Partners, a private equity group. VMG typically invests in mid-sized, well established firms, but the partnership with Sonoma Brands will troll for early-stage companies with proven concepts but lacking know-how in areas such as copacker negotiations and slotting allowances. Greg Steltenpohl’s back story has a Horatio Alger glow. In 1980, he and other founders of Odwalla juice squeezed oranges in a backyard shed and sold the beverage from a van. Nutritionally rich and unpasteurized, Odwalla was a progenitor of the fresh juices now inundating the market. After 16 years (and the introduction of flash pasteurization following an E. coli O157:H7 outbreak), the brand was sold to Coca-Cola for $181 million. Califia Farms is Steltenpohl’s most recent venture. Sun Pacific, a farmers’ coop in California’s San Joaquin Valley, underwrote the 2010 launch of Califia, which promises healthy, plant-based beverages with great taste. Flavor is the key to product success, he believes, even moreso than health benefits. “Trends have to be driven by very charismatic brands,” observes Steltenpohl, not dietary advice from health experts or government agencies. “What changes the country is aspirational brands that make it pleasurable to eat healthy,” he emphasizes. New-to-the-world specialty products were easier to identify three decades ago, but greater capital availability with less-constraining strings, more distribution options and the ability to engage in self-promotion through social media favor new and emerging food companies. “A lot of things are possible today that were not possible back then,” Steltenpohl reflects. Califia’s digital brand building efforts got a boost in September when Stripes Group, growth equity investors focusing on branded products in the $10-100 million sales range, provided $50 million in funding, which also is helping equip a new production facility in Bakersfield, Calif.
Califia is emphasizing products free from dairy, soy, GMOs, gluten, trans fast and carrageenan. Compared to Enjoy Life Foods Inc., though, Califia is a latecomer to the free-from space. Chicago-based Enjoy Life imported the term from Europe when it began producing gluten-free baked goods that also were free from common allergens and now GMO ingredients. Something stronger than gluten binds Enjoy Life to a loyal consumer base. “It’s a tie between taste and trust,” says founder and CEO Scott Mandell. Mandell exemplifies the leaders of new and emerging food companies who bring more business acumen and training than the restaurateurs and family patriarchs who typified food ventures of the past. He and fellow founder Bert Cohen were commercial bankers in the late 1990s when they were pursuing MBAs at Northwestern University. Entrepreneurship was a new course offering, and the two devised a business plan focusing on the needs of individuals with celiac disease, an underestimated and misunderstood population at the time. That plan became the blueprint for Enjoy Life. Presentations to angel investors only raised half the goal of $850,000 in start-up capital, but that was enough to begin production in a rented kitchen. By 2006, grassroots marketing built enough demand to justify a 16,000-sq.-ft. bakery in Schiller Park, Ill.
Scott Mandell is founder and CEO of Enjoy Life Foods, Chicago. “We used to kid we were leaders in a category that didn’t exist,” says Mandell. This summer production will relocate to the Louisville area, in a 200,000 sq. ft. bakery that he believes will be the world’s largest allergen- and gluten-free facility in the world. Funding for the new bakery, which will help catapult Enjoy Life into the international market, is possible thanks to the firm’s February 2015 acquisition by Mondelez International (the sale price was not disclosed). Prior to that, three consecutive years of 40 percent growth boosted annual sales to $40 million. Today’s emerging food companies can benefit from corporate largesse without transferring ownership. 301 Inc., the private-equity arm of General Mills, is taking positions in small, disruptive brands and providing expertise in supply chain, R&D and other support to nurture development. Investments include Beyond Meat, a marketer of plant-based meat analogs, and Rhythm Superfoods, a maker of kale chips. 301 provided most of the $3 million Rhythm received through CircleUpGrowth Fund in January. The strategy of smaller though riskier bets is a hedge against the hefty premiums Big Food pays for more mature acquisitions. In 2014, General Mills shelled out $820 million for Annie’s Inc., four times more than Annie’s annual sales volume. By that measure, Campbell Soup Co.’s 110 percent premium for Garden Fresh Gourmet was a steal. The organic salsa maker had sales of $110 million. Assistance in areas beyond product formulation and scale-up is becoming common at the growing number of incubators and accelerators cropping up. An example is New York’s AccelFoods, which provides business resources and up to $40,000 in exchange for a 6-9 percent equity stake. One success story: Exo, a maker of cricket protein bars, which secured $1.2 million in seed round investment after AccelFoods’ 2014 backing. The business counsel that 301 brings is a template for a growing number of venture capitalists. “If you have $5 million revenue, you’re wearing nine hats and need domain expertise,” says Sonoma’s Sebastiani. “We bring the capital, but we also bring the domain expertise” that emerging firms need. Prime investment candidates have back stories that go beyond the food itself. Venture capital has flowed to Kill Cliff Inc., a fast-growing $8.1 million beverage firm that eschews the energy-drink label and pledges philanthropic support for organizations like Wounded Warrior Project. A trickle of venture capital into food turned into a torrent in recent years. Dow Jones VentureSource pegged food & beverage investments by venture capital funds at $165.4 million in 2013, higher than previous years but less than half 2014’s $376.8 million. In 2015’s first nine months alone, venture capitalization exceeded $542 million. That has triggered a scramble to catch up by pilot plants, many linked to universities, that long have nurtured industry entrepreneurs. Lou Cooperhouse, director of Rutgers University’s Food Innovation Center, expanded on food science and process engineering help to include legal and regulatory consulting, market research, strategy development and other essentials of business operations. Now he’s also focusing on financial matchmaking under the umbrella of the New Jersey Business Incubation Network. To a large extent, incubators are nurturing the innovation that major food companies have long been outsourcing. Cooperhouse began his product development career at Campbell Soup Co. several decades ago. The basic research done in those days has gone away, and applied research Cooperhouse was engaged in is receding into memory. Marketing and selling, not research, drives Big Food. “In the old days, we saw big corporations only acquiring companies in the $50-100 million sales range,” Cooperhouse continues. “Now they’re buying much smaller firms” for their innovative products. “You’ll see more corporations getting involved in incubators,” he predicts, similar to what General Mills is doing. Dave Beck concurs. Before he became president and CEO of Toledo, Ohio’s Center for Innovative Food Technology in 1995, Beck worked in food processing, including a stint at Campbell. The entrepreneurs CIFT works with are shouldering the R&D work and supplying the innovation that used to flow from big companies. “These younger, nontraditional people are not their father’s food company with their long, expensive development cycles,” points out Beck. Califia’s Steltenpohl takes a contrary view. “We are a food processor,” he asserts. “We’re not a virtual company.” He’s also not sold on the notion of growing Califia to a certain level and selling. “We’re attracting a lot of like-minded people and don’t want to compromise on product integrity,” he says. Authenticity demands consistent standards, and owners of multiple brands can’t deliver that. 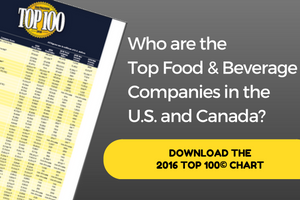 The Food Processing Top 100© is the definitive list of the top companies in the North American food and beverage industry. Download your copy of the 2015 Top 100© today. Impatience is a mark of youth, and it remains to be seen if today’s younger entrepreneurs will grow bored if the pace of change is slow. “The scale of change is enormous,” observed Tony Michaels, CEO of Midwestern BioAg, at October’s Food for Tomorrow conference in New York. To illustrate, he cited the food company that wanted to change a raw material characteristic in one of its brands. “A million acres has to change” to accommodate the request, he ruefully noted. Enjoy Life’s cofounder Bert Cohen left the company in 2006. Two years later, he got back in the game with the purchase of Surf Sweets, a maker of organic gummy bears and jelly beans. “The food business is capital-intensive, whether you’re manufacturing or not.” Slotting fees, food safety regulations and other overhead costs create a survival of the fittest scenario. If interest rates spike or the economy tanks, funding could dry up. “The amount of capital coming into the market and the number of companies coming in is not sustainable,” he believes. Major corporations like Kellogg were the healthier-eating upstarts of their day. Today they are beset with suspicion and distrust. When they acquire successful, emerging companies, they want more than their recipes: They want their credibility. “If they can figure out how to acquire companies like us without screwing it up, they can replicate it,” Mandell says optimistically. The trends are clear, and Big Food wants them to be part of its story, too. Can New Englanders Grow and Process Most of their Food Regionally? Start-up food companies are everywhere, but very few have their own production capacity. Josh Tetrick: Hero or Hustler? Why a free-from pioneer sold his successful food company to a multi-billion-dollar firm. Where Have All the Food Plants Gone?